Bob Fenwick a one-term member of the Charlottesville City Council who served from 2013 to 2017. He was defeated in the 2017 Democratic primary. He also ran two unsuccessful campaigns as an independent candidate for the Charlottesville City Council during both the 2009 election and 2011 election. He also ran in 2009 and placed third and placed fourth in 2011. Fenwick is critical of the West Main Streetscape project, which has been under development since fall 2013. He also wants to improve communication between the city of Charlottesville and Albemarle county. Bob Fenwick was a Combat Engineer commander during the Vietnam War and moved to Charlottesville in 1976 when his wife, Victoria Fenwick, attended the University of Virginia Law School. Fenwick formally announced his candidacy for re-election on March 24, 2017 at the Freedom of Speech Wall. Fenwick faced Heather Danforth Hill and city School Board member Amy Laufer in the Democratic primary on June 13 but placed third in the two-way race. Fenwick tied with Wes Bellamy with 1,088 votes each in the June 11, 2013 Democratic primary. After a count of the provisional ballots, Fenwick edged Bellamy by 5 votes. Fenwick's total campaign contributions through the period ending May 29, 2013 were $280. All of that consisted of a loan to himself. Fenwick also participated in a questionnaire on public housing conducted by the Public Housing Association of Residents. In the campaign period from July to August 2013, Fenwick received $4,952 in donations. Fenwick was an independent candidate for City Council in 2011. He turned in over 1,000 signatures, far exceeding the 125 required to be placed on the ballot. However, he was unable to win in his second attempt. Overall voter turnout for City of Charlottesville in this election was 37.31%. Each voter could vote for up to two candidates. 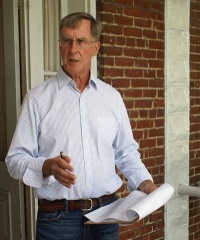 Bob Fenwick, a member of the McIntire Park Preservation Committee, launched his campaign announcement on the steps of his downtown-area home on May 15, 2009. He said his candidacy would be a referendum on the Meadowcreek Parkway. On Friday, September 25, The Sierra Club endorsed Fenwick along with opponent Dave Norris. Fenwick was opposed to the building of the YMCA on the western end of McIntire Park, the temporary displacement of the Dogwood Festival, as well as the removal of a public wading pool. Fenwick held a forum on July 19, 2009 detailing his opposition to the Meadowcreek Parkway. Fenwick also said he was a supporter of adding dredging into the community water supply plan. Another important issue Fenwick said he would promote is economic development. He told the media at his campaign launch that he will announce specific steps he would like to see the City take in order to create jobs. and providing tax relief for new businesses. ↑ Web. Szakos, Fenwick win Charlottesville City Council seats, Aaron Richardson, Daily Progress, World Media Enterprises, November 5, 2013, retrieved November 6, 2013. ↑ 3.0 3.1 Web. It's official: Fenwick to be on ballot for City Council, K. Burnell Evans and Aaron Richardson, Daily Progress, World Media Enterprises, June 14, 2013, retrieved June 19, 2013. ↑ Web. Laufer, Hill win Democratic council nominations; Fenwick out, Sean Tubbs, News Artile, Charlottesville Tomorrow, June 13, 2017, retrieved December 5, 2017. ↑ 5.0 5.1 Web. Former Councilor Fenwick will seek another term, Staff reports, Daily Progress, World Media Enterprises, February 18, 2019, retrieved February 24, 2019. ↑ 6.0 6.1 Web. Dems sweep City Council elections, Graham Moomaw, Daily Progress, World Media Enterprises, November 8, 2011, retrieved November 8, 2011. ↑ 7.0 7.1 7.2 Web. Fenwick, Long announce bids for City Council, Sean Tubbs, Charlottesville Tomorrow, March 24, 2017, retrieved March 29, 2017. ↑ Web. Fenwick: Community's trust in Council needs restoring, Aaron Richardson, Daily Progress, World Media Enterprises, June 2, 2013, retrieved June 10, 2013. ↑ Web. Charlottesville Councilor Fenwick Files Paperwork to Seek Re-Election, Henry Graff, retrieved March 20, 2017. ↑ Web. Bellamy, Fenwick in dead heat; Szakos wins easily, Aaron Richardson, Daily Progress, World Media Enterprises, June 12, 2013, retrieved June 12, 2013. ↑ Web. Palmer, McKeel lead local candidates in fundraising, Daily Progress Staff Reports, Daily Progress, World Media Enterprises, June 7, 2013, retrieved June 10, 2013. ↑ Web. [ Questionnaire for City Council Candidatesurl=http://www.pharcville.org/2013/06/04/phar-questionnaire-for-city-council-candidates/], NCB29, March 22, 2017, retrieved March 22, 2017. ↑ Web. Local campaigns garner support from political parties, business PAC, Maggie Ambrose and Brian Wheeler, Charlottesville Tomorrow, September 22, 2013, retrieved October 3, 2013. ↑ Web. Independents battle Democrats, each other for City Council, Graham Moomaw, Daily Progress, World Media Enterprises, August 25, 2011, retrieved August 25, 2011. ↑ Web. McIntire Park activist Bob Fenwick launches independent campaign for City Council, Sean Tubbs, Charlottesville Tomorrow, May 15, 2009, retrieved March 11, 2013. ↑ Web. Council candidate holds forum highlighting opposition to Meadowcreek Parkway; Blames Albemarle for its growth and lack of road building, Brian Wheeler, Charlottesville Tomorrow, July 19, 2009, retrieved March 11, 2013. ↑ Web. Candidate Bob Fenwick announces agenda for creating local jobs, Brian Wheeler & Julia Glendening, Charlottesville Tomorrow, July 7, 2009, retrieved March 11, 2013. This page was last edited on 24 February 2019, at 14:22.